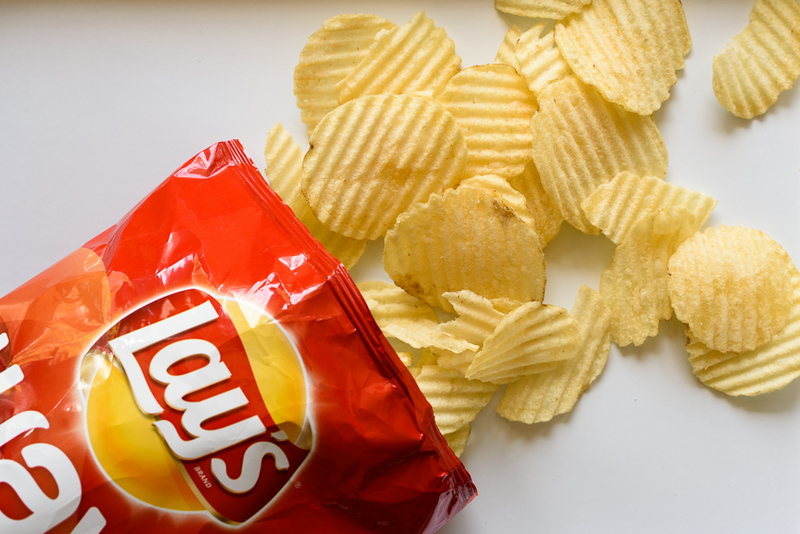 This post is in partnership with Frito-Lay. All opinions, as always, are my own. Thank you for supporting the brands that support Fork Knife Swoon! 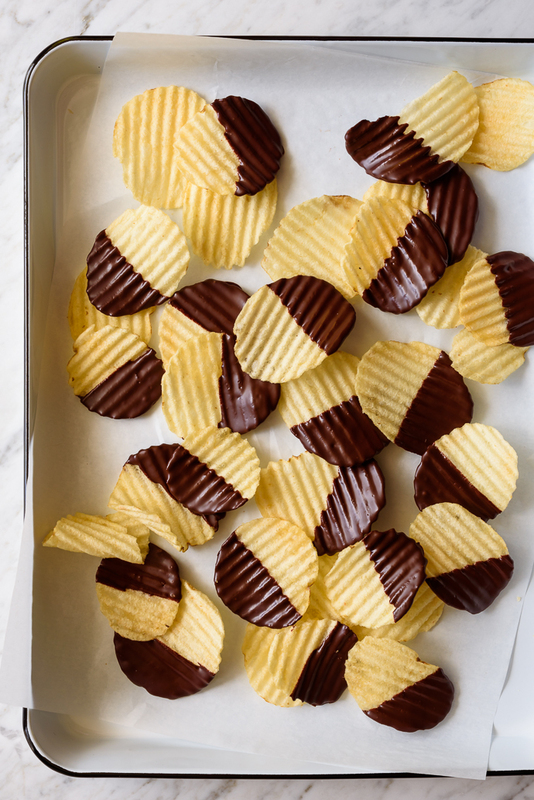 If you spend any amount of time looking at food on the internet, you’ve probably come across the perfectly simple, indulgent treat known as chocolate-dipped potato chips. You may have even ventured to make them. 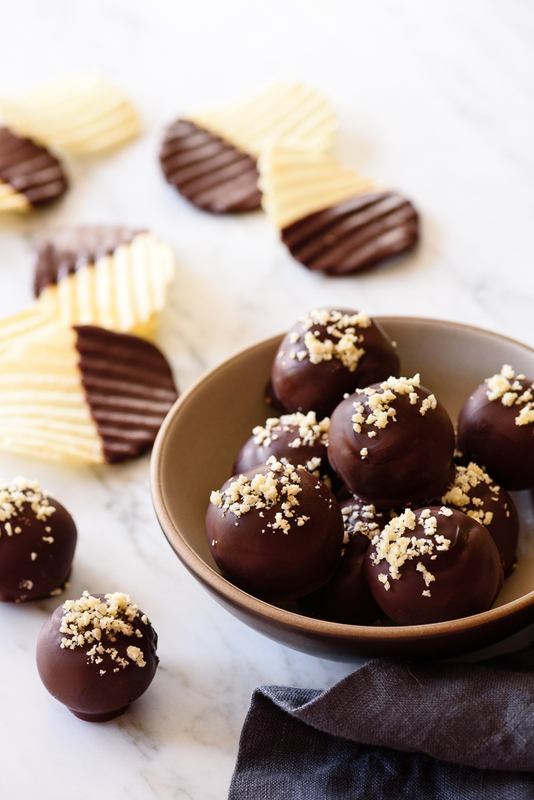 Well, we are taking chocolate-dipped potato chips to a whole new, deliciously sweet, salty, and crunchy level, with these chocolate peanut butter potato chip bonbons, and I think you’re going to love them. I know this combination might sound weird, but I promise you that a.) I have not lost my mind, b.) I am not pregnant (sorry, Mom! 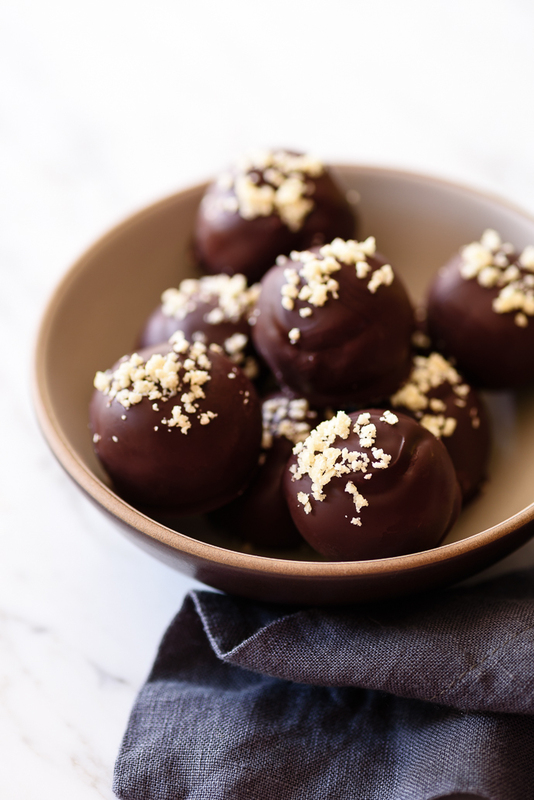 ), and c.) these luscious little bonbons taste like the very best version of a chocolate peanut butter cup – with an extra bit of crispy, ever-so salty crunch to their creamy, flavorful centers – and are just to-die-for. 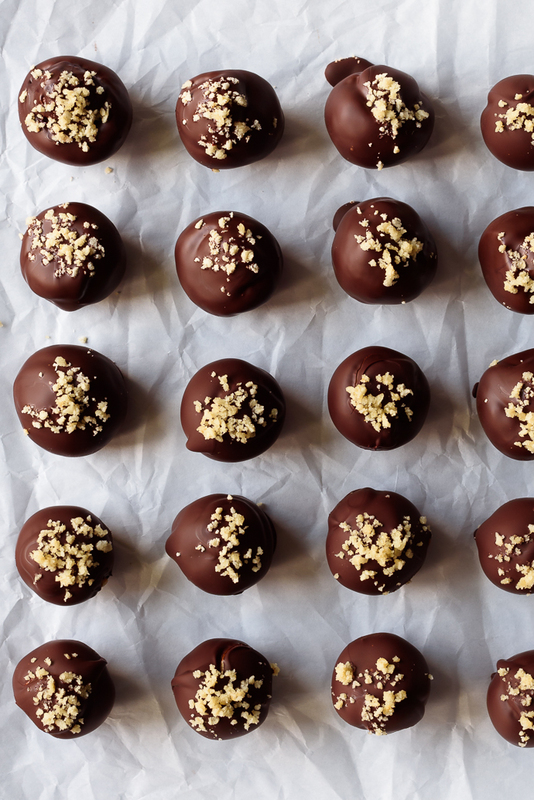 These crunchy bonbons are super easy to make, and come together similarly to a classic truffle. 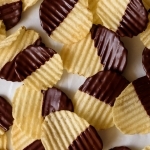 Simply crush the potato chips, mix together the filling, roll into balls, chill, then dip in melted chocolate. No oven required, simple enough even for kiddos to help with, and a perfect crowd-pleasing sweet treat to cap off Summer barbecues. You might not expect to (successfully) integrate classic potato chips into dessert. I know it’s unexpected, and to be honest, I wasn’t sure this idea was going to work. What science experiment had I dreamed up? But, when you crush up the potato chips into delicious, crisp-ity crumbs, mix them with creamy peanut butter, a bit of powdered sugar, and nutty almond meal, then enrobe each lovely little bonbon in deep dark chocolate, you realize that this was a match made in heaven from the very beginning. After one bite, I knew any previous doubts were completely unfounded. The potato chip crumbs add the perfect amount of subtle salt and crunch to the already unbeatable duo of chocolate and peanut butter. If you’re already a fan of chocolate peanut butter cups – or salted dark chocolate – these will be right up your alley. Either way, I hope you enjoy these salty-sweet, chocolate-y bites! In a large mixing bowl, stir together the peanut butter and confectioners sugar until mixed. Add the almond meal and potato chip crumbs and stir until completely combined, and the dough is thick and scoop-able. Roll the dough into 12 balls (I like to use a cookie scoop to evenly portion the dough), and place on the prepared pan. Freeze for 15 minutes. Meanwhile, melt the chocolate in either a double-boiler over gently simmering water, or in a heat-proof glass bowl in the microwave. If using a microwave, heat in bursts of 30 seconds on medium power, stirring well and scraping down the sides of the bowl with a spatula after each increment, until the chocolate is completely melted and smooth. Dip the bonbons in the melted chocolate, one at a time, using two forks or a candy dipping tool to roll until evenly coated. 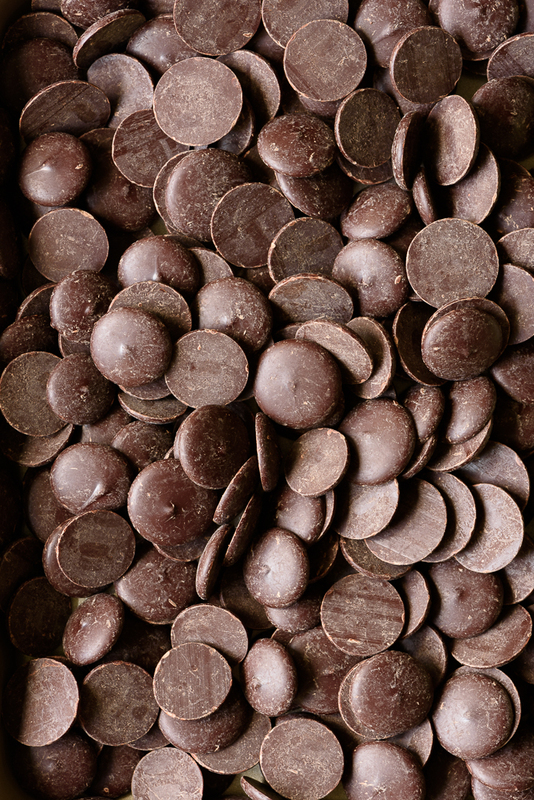 Let the excess chocolate drip back into the bowl, then transfer the bonbons back to the baking sheet. Sprinkle with crushed potato chip crumbs, and let sit until the chocolate is set. Work in batches until all bonbons are coated. Enjoy! DO YOU THINK THESE COULD BE MADE AHEAD AND FROZEN? BEFORE DIPPING, OF COURSE. THEY LOOK AMAZING!!! Hi, Alicia! Yes, definitely can be made and frozen. You might want to let them warm up a bit from completely solid frozen before you dip them in the chocolate or they may crack… Enjoy!! Hi! I’d love to make these but can’t use almond meal/flour. Is there a good substitute? Hi! I assume you have an almond allergy? If it’s just almonds, you can sub any other type of nut flour/crushed nuts. Peanuts would be the obvious choice, but hazelnuts or pecans would be great too. If you can’t eat any nuts, I would probably try adding just a little bit more powdered sugar and crushed potato chips – just enough that you can easily scoop the filling into balls and they hold together, without the filling getting too sweet. OR, you could also just omit the almond meal, and make these into traditional peanut butter cups, by layering melted chocolate in the bottom of mini muffin tins, letting it set, topping with a scoop of the pb-potato chip filling, chilling, and layering with a final layer of melted chocolate. That was a long answer, but I hope it helps and you’re able to enjoy these!! Thanks, Lara! Thank you — it’s all tree nuts. Both solutions sound yummy! This is such a creative recipe. I would have never thought to crush up the chips and add them in to add extra crunch. I can only imagine how wonderful it must have tasted after mixed in with peanut butter and chocolate. I also love the chocolate dipped chips. They are so easy yet so SO delicious. Especially for people like me who can’t get enough of the sweet and salty flavor combination. That salty-sweet combo is everything 🙂 Thank you, hon! These certainly look decadent — and delicious! I just drooled! OH my does this sound delicious! I would LOVE to invite you to share this with my viewers at Cooking and Crafting with J & J. Definitely my kind of candy!! This salty-sweet combination of flavours is awesome, friend!! And like, SO EASY! Love that salty-sweet 🙂 Thanks, Katrina!! 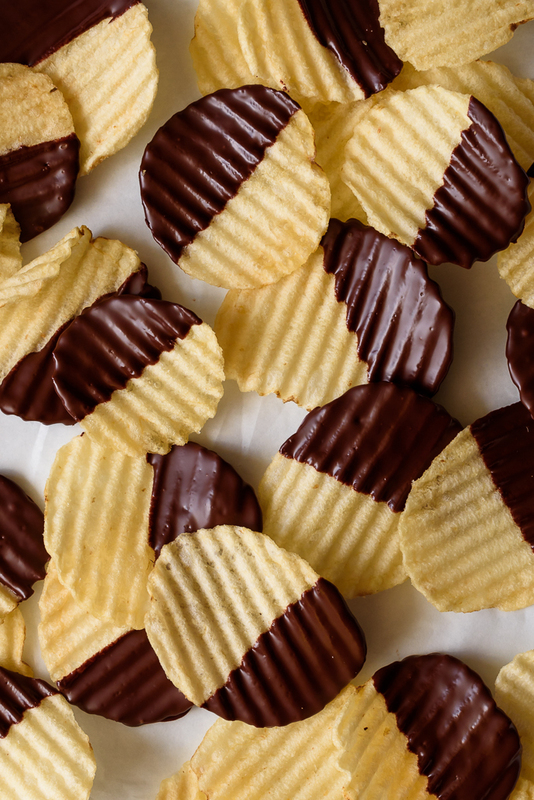 I love the combination of chocolate and salty potato chips! What kind of chocolate dipping tool do you use? Oops! I forgot to link to it – this is the set that I have: http://amzn.to/1Yi59Qt. I think there are fancier versions out there, but this one works pretty well. I usually use the round one. Thanks, Ellie! !